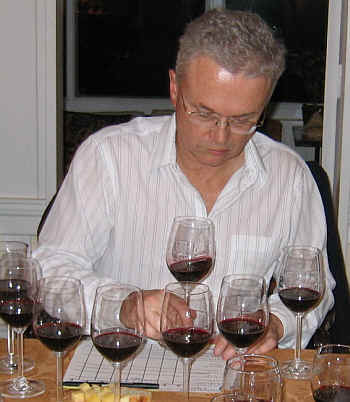 We assembled a set of wines, seven of them from the 2005 vintage and one from 2003, all being "currently released" Cabernets. The 2005 growing season saw wet weather in the Spring, with cool weather in May and June. It became rather hot in July and then cooled off in August. The late start to the growing season meant a late harvest in terms of the calendar. Probably due to the ample water from the winter and early season rains, the crop was larger than normal. We put together a bunch of relatively new or unknown labels, with one well-established, big winery brand, Mount Veeder Winery. The overall quality was quite good with no flawed or bad wines in the group. Whether or not you're willing to pay $50, or more, for these wines is another story, though. Today, it seems, most Napa vintners view $60 as the entry level pricing for a bottle of Napa Cabernet. 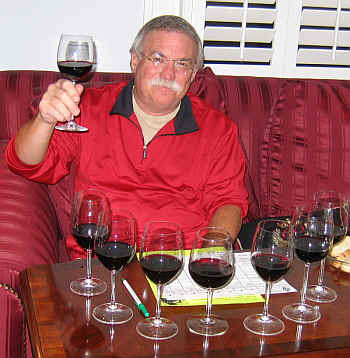 We were delighted when the least costly wine wins the tasting. But the wines were very close in terms of quality and not a lot of 'distance' between them. This was born out in the rankings and total number of points...First and Second places were essentially tied with Third and Fourth places being two and three points behind. 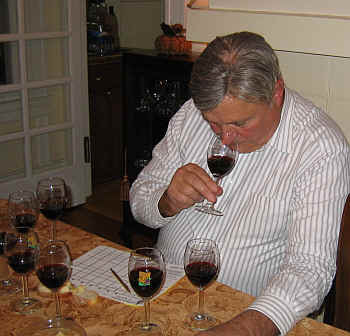 This means had one taster flip-flopped a particular wine in his ranking, it could have catapulted the fourth place wine into the winner's circle. Showing a clear, deep ruby color, the Cenay Cabernet offers mildly oaky, vanillin and woodsy themes on the nose. It's a dry wine with ample acidity and I found it to be medium+ to full-bodied. It's a moderately tannic red with a lot of mocha and toasty oak notes on the palate. Dry and somewhat astringent, it may go for 5 to 10 years, well-stored. It earned a one-and-a-half star rating on my three star scale, no stars being a standard or ordinary wine. 7th Place: LEO JOSEPH 2005 Napa "Lawrence Harrison Vineyards"
With good clarity and deep ruby color, this new, small venture features a theme of cassis and blackcurrants. The nose has that herbal quality one finds in Cr�me de Cassis and this is the predominant character of this wine. This fruity or herbal quality continues on the palate and the wine is nice, fruity and elegant. It's a bit old-fashioned and not the sort of fruit bomb which is more fashionable these days. I gave it a one star rating and, despite my last place ranking, still found this to be a good bottle. I would question its price, though, as the scarcity tax here seems high. Showing a deep purple color, this wine features sweet berry-like fragrances on the nose. There's also a sweet note from the oak in which it was matured. 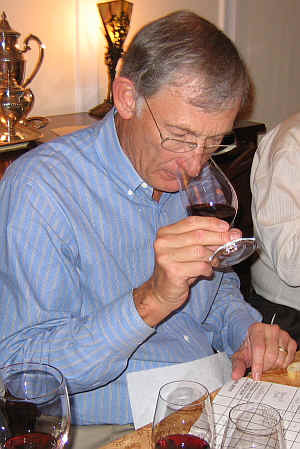 I liked the nose very much, but wondered whether or not the wine was actually dry. This continued to be bothersome over the course of the tasting...I found the wine to have a bitter note on the palate and didn't find what I perceived to be a sweet quality as 'balanced.' For me the bitter and sweet elements have a tug-of-war on the palate. I gave it a one star rating, but this, given the lovely fragrances is far less than it should have earned. Deep in color, this is another nicely fruity, berryish Cabernet. 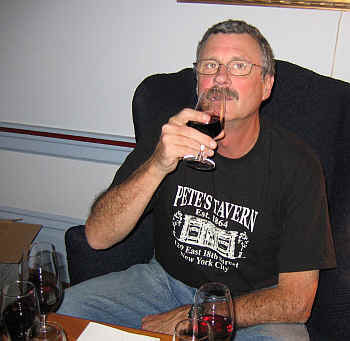 I also detected a nice mix of oak on the nose which was very pleasant and intriguing. It's dry and has a modest level of acidity. Medium-full to full-bodied, the wine offers lots of black fruit notes on the palate. It's full, big and deep with a moderate level of tannin suggesting 5 to 10 years of cellaring potential. I've usually found the wines of the Two Hands brand from Australia to be hugely over-priced, so I was pleasantly surprised to find a wine which offers a level of quality reasonably commensurate with its price tag. One-and-a-half stars+. Deep ruby in color, this wine features lots of blackberry and black fruit aromas. It's dry and has a moderate level of acidity. This is a full-bodied, brawny Cabernet with lots of dark fruits. I felt it was a bit hot on the palate, though. There's a spice element here, as well. With 5-10 years of cellaring potential, I gave this a one-and-a-half star rating. Here's a wine which was either at a disadvantage or it had an advantage by being two years older than the other wines in the tasting. The wine shows nice, deep, dark color with an intriguing fragrance of violets and blackberries. It's dry and nicely elegant on the palate. Medium-full bodied. 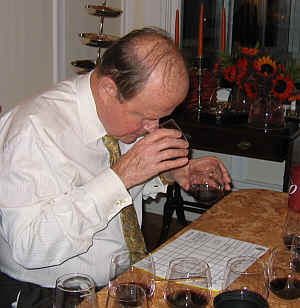 I, again, noted its elegance and mild tannins (perhaps due to it's being older). I didn't find it to be as structured a wine as some others and felt this is probably best as a short-term bottle for the cellar. I gave it one-and-a-half stars. Clear and deep in color, this wine offers plenty of sweet oak fragrances and a cedary, woodsy character on the nose. It's dry and moderate in terms of acidity. Medium+ bodied, the wine has a little 'bite' on the palate from the tannin. Nice dark fruit tones in the mouth, it's a good bottle of Cabernet. I felt it has 5 to 8 years of cellaring potential. One-and-a-half stars. Deep and dark in color, this wine is teeming with dark fruit aromas and a nicely oaky bouquet. Very showy on the nose, it's dry on the palate. Medium-full bodied, the Mount Veeder Cabernet shows nicely oaky, cedary flavors with plenty of fruit on the palate. Very showy. I felt this can cellar well for 5 to 10 more years. Two stars.